The men’s basketball team wins two games over last-place teams. ANNA ZHILKOVA TTN (Top left) Fans cheer on the Owls as they beat Charlotte last Wednesday. (Top) Junior center Michael Eric goes up for a basket against Charlotte junior guard Javarris Barnett. The men’s basketball team performed about as well as anyone could expect it to against the Atlantic Ten Conference bottom-feeders Charlotte and St. Joseph’s this past week; both games were convincing victories. Last Wednesday at the Liacouras Center, four Owls scored in double digits to give the team a 76-67 win over Charlotte, a team that sits in second-to-last place in the A-10 with a 9-12 overall record and a 1-6 conference mark. Sophomore guard Khalif Wyatt led the team in scoring with 17 points and contributed six rebounds and six assists. Junior guard Ramone Moore had 16 points and junior forward Scootie Randall had 14 points against the 49ers. Senior forward Lavoy Allen rebounded from his relative absence in the team’s 88-77 loss to Xavier where he had zero points and three rebounds with a double-double of 15 points and 11 rebounds. Allen had three blocks, which Allen said meant a lot to him after what happened against the Musketeers. Charlotte put up a fight, having four players score in double figures. Sophomore forward Chris Braswell and junior guard Derrio Green each had 15 points. Sophomore guards Jamar Briscoe and KJ Sherril put up 14 and 12 points, respectively. On Saturday, the Owls visited the Palestra to take on their Big 5 rival St. Joseph’s, but as of late, the series has been lopsided. After defeating the Hawks, 72-54, the Owls have won the past eight games against St. Joe’s. The Hawks have had a rough year on top of a stretch of futility against Temple, losing 14 of their last 16 games and are in a eight-game losing streak en route to a 5-16 overall record and a 0-7 mark in conference play. With that record, the Hawks are sharing a spot in the A-10 cellar with Fordham, who also has yet to win a conference game. Temple had the lead from the beginning to end and dominated the Hawks on the glass, out rebounding St. Joe’s, 38-23. Allen, who posted his fifth and first consecutive double-double performance with 15 points and 12 rebounds was a key factor in the St. Joe’s win. Allen cited a renewed commitment to conditioning as the reason for the statistical resurgence. Leading the Owls in points was Randall, who had 17 points against the Hawks. Randall has played fairly well recently, including the game against St. Joe’s. Randall has had 17, 14 and 28 points over the past three games, raising his average to 10.5 points per game, the third highest mark on the team. “I worked extremely hard this past summer to get me to this point today and I think I’m making the best of the situation,” Randall said. The team’s leading scorer, Moore, who’s averaging 14.8 points per game, scored 10 points in the win over the Hawks, marking the 15th consecutive game he has scored in double figures, dating back to the team’s 65-53 win over Central Michigan on Dec. 1. Up next, the Owls will have another Big 5 and A-10 contest on Olney Avenue against La Salle on Wednesday. 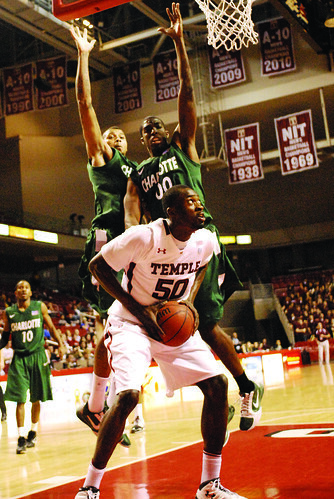 Tipoff is at 7 p.m.
Quenton DeCosey paced Temple with 21 points en route to the Owls’ 77-59 win Wednesday.